Hey guys! I just wanted to share a day of winter fishing I had an especially good time. As we all know the Yakima River has had an especially harsh winter. In fact, on Valentine's Day there was ICE FLOW. Can you believe it? Last year at this time we were having great fishing. Now we have to hope for it to get about 30. Tip #1... get good fishing gloves. 2 pairs, if you catch and release a few fish or strip enough wet line your first set will get soaked. While many anglers, like me, usually enjoy this river year around we had to get creative to feed our fly fishing itch. This year when the river came into fishable condition between ice flows and crazy cold weather snaps I found lots of awesome rainbows ready for a good meal. The windows between ice flow have been narrow but if you hit them just right you can put some fish in the net. A few days ago I went out with a friend, Patrick Barta, who also guides with us here at Reds. Not only because he takes phenomenal photos, as you will see in this blog, but because hes a heck of a lot of fun to fish with. We went with an Irene to Ringer float. We knew of the portage ahead of us, but we were up for the adventure and challenge because with hard work comes great reward. Plus some of the boat launches in the Canyon are still pretty iced in. We took off with a variety of rods set up. We brought a trout spey, single hand spey, nymphing rods, and even a dry set up just in case. Seems like a lot, but it later payed off. Not far down the river, after a few stops to swing streamers and toss some nymphs, sure enough we saw fish actively rising. Seriously? It was sub freezing. Of course the excitement had us quivering. We anchored up and I tied on a real small dry with an emerger pattern tailing. Fish feeding on these midge are very tough. While I tried my dry fly attempt Patrick got into some trout on his nymphing rig. 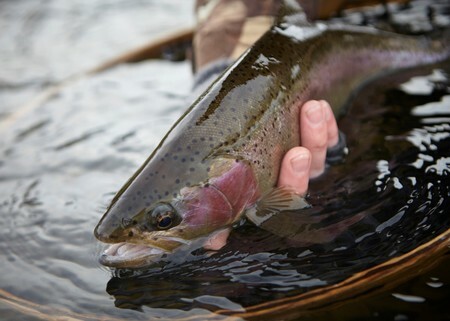 I eventually switched to one of Patricks home tied streamers and found some success of my own. This spot was a great beginning to the trip. 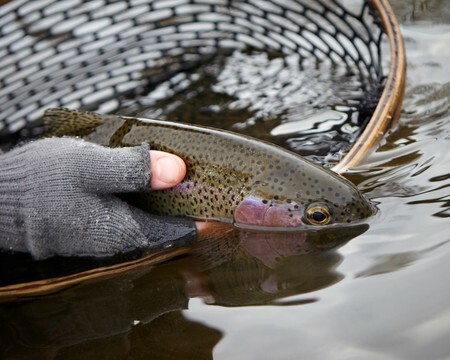 The dry fly never panned out but you can't win if you don't play. Give this one a shot for feeding fish this time of year. We stopped at every run and spent some time swinging for trout. We followed up with a nymphing rig. We had good success on both set ups. When we found ourselves at the portage we took a quick break, set up an efficient plan, and got at it. Here is a picture of our path! The trick here is to find a path of least resistance across the snow and stop the least amount possible. Thankful to have 2 of us to complete the task we looked down river for our next fishing opportunity. We found more success as the day went on. Patrick picked up our last fish of the day not far above Ringer launch and we pulled in around 5PM. All in the entire trip was great success. Both of us had an incredible and memorable trip. We saw a good amount of fish for a winter trip and all of them had great size to them. We both went home with more memories, more happiness, and a belly hungrier than the fish we caught. Please contact me when the river becomes fishable. I would like to book a day with Nate.